To Jesus Christ be the glory and power forever and ever! Amen. Look, he is coming on the clouds! Everyone will see him, including those who pierced him. All peoples on earth will mourn over him. So shall it be! 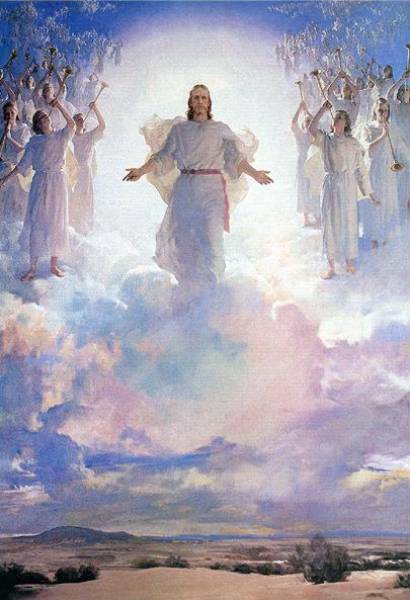 "I am the first and the last," says the Lord God Almighty, who is, who was, and who is to come. Do you enjoy a good mystery crime novel or TV show? Recently I read the novel Roadside Crosses by Jeffery Deaver. In the first few chapters it became clear who the murderer was and the hunt was on to catch him before he could commit any more crimes. A lot happens between the first and last chapter and in the end the murderer named at the beginning of the book becomes a victim of the real perpetrator. In the last chapters there is the explanation by the chief investigator how she came to the conclusions she did and everything falls into place. Over the years we’ve had a lot of TV programs that follow a similar pattern. Remember Murder She Wrote. Angela Lansbury plays a writer of mystery novels who has the happy knack of solving crimes that have the police baffled. Then there was Columbo, the seemingly slow-witted and untidy detective, who solved the most difficult cases. More recently we have Law and Order, Criminal Minds, and CSI. One wonders what makes these programs so appealing. Each episode is so predictable. They start with a crime and finish with the perpetrator being named and arrested. Maybe the appeal in these programs is that evil is always punished. That satisfies our sense of justice. Another reason we like these stories is that even though the beginning and the ending are predictable we want to see how the events unfold in the lead up to evil. We know from the Bible that this world will come to an end. We hear Peter tell us, "The Day of the Lord will come like a thief. On that Day the heavens will disappear with a shrill noise, the heavenly bodies will burn up and be destroyed, and the earth with everything in it will vanish" (2 Peter 3:10). Then Jesus will return and those who trust in him will be resurrected to a new life in heaven. We all know that one day our lives on this earth will end. There is nothing more certain than our own death. This is the story of every human born on this planet. We are born and we die. That might sound scary, fatalistic, and depressing. However, the real interesting part of life is what will happen between our beginning and our end. How will our story unfold between now and that day? Some young people may or may not have any idea of what they would like to do when they leave school. Will they go on to university? Get a job or learn a trade? What kind of job will they look for? Where will their jobs take them? What will they be doing in 2, 5 or 10 years time? There are those who are looking toward retiring and ask, "How much time do we have left to do the things we want to get done? Where will we retire? Will we have good health? Will we travel? What will we be doing in 2, 5, or 10 years time?" There are those who are advanced in years. It has been a long time since their birth and their end in this life is drawing closer. They ask, "Will we be still here in 2 or 5 years time? Ten might be pushing it a little". What is ahead of us in the future? Would you like to know? We may have quite definite plans for the future, but there is no guarantee that our plans will be fulfilled. If we look back over the past year I’m sure we would be able to say that things happened that we hadn’t planned. Maybe surgery, a death, a tragedy, or just small things – like having your car at the smash repairers, a disagreement with a neighbour, the arrival of a grandchild, the sudden death of a friend. As I said, we know how the story of our lives will end but what events will fill our lives between now and the day we take our last breath can be scary stuff. The same can be said about what will happen in the world between now and the end. Jesus warns us that there will be earthquakes, wars, persecutions, famines, false teachers who will lead people astray, and catastrophes among the stars and planets. These are signs that we are in the last days before Jesus will come back. He says "these things will be like the first pains of childbirth" (Mark 13:8). We have experienced these things already but there is more yet to come, and like the intensifying of a mother’s labour pains, even worse things will happen before Jesus comes again and brings in a new heaven and a new earth. And since we don’t know exactly when Christ will return we wonder how long and how intense these disasters on earth will continue. We wonder how all this will affect us and those we love. We wonder what world events will fill our newspapers between now and Jesus’ return. Will the peace in our country last? What kind of natural disasters will come our way in the future? And how hard will it be for us to live out our faith in the increasingly secular society that we live in? Like the mystery crime stories, we know how all this will end, but it’s what will happen between now and then that worries us. "How will we survive what happens between now and then?" – that was the question that was foremost in the minds of the early Christians who read the Book of Revelation the first time. The Roman Emperor Domitian declared himself "Lord and God" and launched a full scale attack on the Christians, mercilessly torturing those who would not recognise the emperor as god and renounce their allegiance to Jesus Christ. Those early Christians knew that Christ would come again soon and lived in the hope that his return would be sooner rather than later, but in the meantime they must have wondered how they were going to see this terrible time through. Would they have the stamina and the courage to remain faithful to their Saviour? They needed as much encouragement as possible. To help those suffering, Jesus appeared to John in a vision. John himself was exiled on the island of Patmos at his majesty’s pleasure. We read, "God gave him this revelation in order to show to his servants what must happen very soon" (Rev 1:1). What follows in the Book of Revelation are words of reassurance and hope; they are reminders to the early Christians and us that we are not alone as we face everything that will happen between now and the time Jesus returns. When things are uncertain and dangers are lurking ahead that will threaten and hurt us, there is nothing like knowing that there is someone who has control over all the events of history, who even has control over those things and people that are menacing us, in the case of the early Christians, the emperor and his cronies. John writes, "Grace and peace be yours from God, who is, who was, and who is to come, … and from Jesus Christ, the faithful witness, the first to be raised from death and who is also the ruler of the kings of the world." and that Jesus is the King of kings; he is lord even of those rulers who hate him and his followers and do their utmost to eliminate the Word of God from this planet. "Jesus loves us, and by his sacrificial death he has freed us from our sins and made us a kingdom of priests to serve his God and Father. To Jesus Christ be the glory and power forever and ever! Amen" (Rev 1:5b-6). The Lord God says, "I am the Alpha and the Omega, the one who is and was and is coming. I am God All-Powerful" (Rev 1:8 CEV). There is no other God like this God. He is ruler over all. The emperor might claim to have absolute power, but to the Lord God almighty belongs all power in heaven and on earth. He controls all things. He is the beginning and end of all history. He has the last word about how this world will end. The emperor claims to be lord and god, but he is nothing compared to the greatness of the Lord God Almighty. This is brought out in the rest of chapter 1 when Christ appears to John as the emperor over all emperors, the lord and king over all lords and kings. You can see what is happening here. The early Christians and Christians of all times who have worried and have wondered how they will survive the troubles between now and the return of Christ, can rest assured that God Almighty, the Alpha and Omega, the beginning and end of all things, will always be there to strengthen, comfort and encourage. Jesus promised, "I am with you always to the very end of the age." Note the words, "to the every end of the age". That means that even when the going gets tough between now and the end of the age, and all the things that Jesus said will happen during these last days do threaten us, he will always be there. He has the power to help. He is the one who gives us hope in the face of adversity. The psalmist might have been talking about surviving the time between now and the return of Christ when he wrote, "Even though I walk through the valley of the shadow of death, I will fear no evil, for you are with me" (Psalm 23).